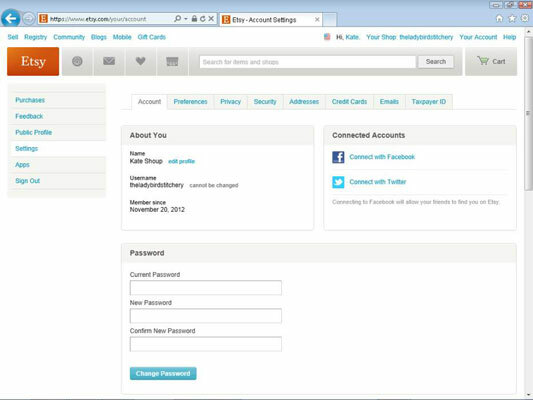 Etsy groups several account-related settings in one area in Your Account. These include options related to purchases, feedback, your public Etsy profile, settings, Etsy apps, prototypes, and cases. For more info, read on. Anything that you buy on Etsy appears on the Purchases page, which appears by default when you click the Your Account link along the top of any Etsy page. 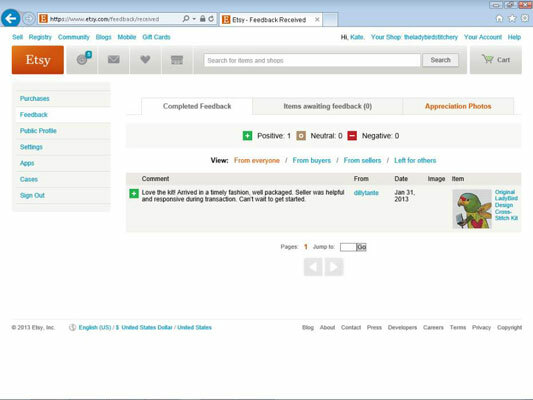 You may view your purchased items to review an item’s receipt (by clicking the View Receipt link) or to reconnect with a seller (by clicking the Contact button or Shop link by her avatar). To get a sense of your rep on Etsy, check out your feedback in Your Account. Simply click the Feedback link along the left side of the Your Account page; then select the Completed Feedback tab to see the scuttlebutt. You can also leave feedback for other members and view appreciation photos in this area of Your Account. Your Etsy public profile is just what it sounds like: a page where other Etsians can go to learn all about you and your Etsy shop. Populating your public profile is a big part of running a successful Etsy shop; after all, a big reason people shop on Etsy is to forge a personal connection with the people who make what they buy. 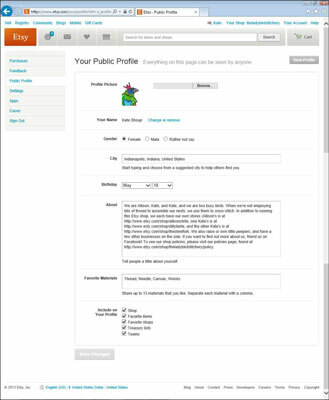 You populate your public profile from, well, the Your Public Profile page. To access this page, click the Public Profile link on the left side of the Your Account page. Viewing and changing your account settings — such as your password; e-mail address; filtering, language, currency, and other preferences; privacy settings; security settings; mailing and shipping addresses; credit-card settings; e-mail notification settings; and taxpayer ID — is a breeze. To access these settings, click the Settings link on the left side of Your Account; then click the tab you need — Account, Preferences, Privacy, Security, Addresses, Credit Cards, Emails, or Taxpayer ID. Loads of apps are available for Etsians to enjoy. You can find apps to help you run your Etsy store, compile Etsy Treasuries, and more. You can access apps connected to your Etsy account on the Apps page, which you view by clicking the Apps link on the left side of Your Account. To see a list of available Etsy apps, click the App Gallery link on the Apps page. Note that, for the most part, Etsy hasn’t developed these apps; third-party vendors create them. If you have trouble with one, you need to contact the vendor, not Etsy. If you’ve opted to join any Etsy Prototypes, those will be accessible here. A Prototype is an experimental project that explores different ways of using Etsy. If a buyer opens a case against your shop — which may happen if a buyer doesn’t receive the item he ordered or if that item, in his view, was not up to snuff — you’ll be able to view details about the case here. Note that you can also access this page by clicking the Cases link that appears in the Options section in Your Shop. In addition, an alert will appear at the top of your screen when you sign in to Etsy if your account has a new or open case.